My third pic of the Maasai Market in Nairobi. Some of the interesting items for sale here are musical instruments, and the seller is playing to attract customers. The baskets are also very popular both among the tourist and natives, they are well knitted and versatile in colors and shape. 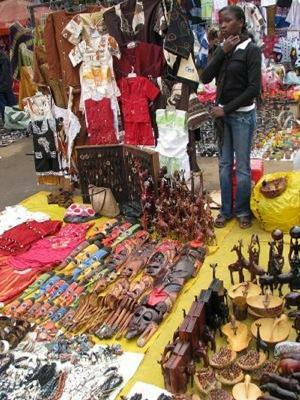 The prices at the Maasai Market are reasonable, provided you master the art of bargaining! Navid, another nice pic. I enjoyed the craft work in Kenya very much. Such nice handmade things aren't made anymore in Europe or North America - it's too expensive. But in Kenya... everywhere!